The Big Apple is one of the world’s ultimate city break destinations with more boutique shopping, hip and cool New York Hotels, art and sightseeing than you could possibly dream for. Unfortunately – like most major capital cities – it’s also notoriously expensive. So for those without endlessly deep pockets, we have selected the best and coolest budget hotels in New York. Travellers Tip: Try to book your NYC budget hotel as far in advance as possible and don’t plan your visit at peak times, this is to ensure you’ll get the best price. You’ll also find the popular lower priced hotels in New York get booked up very quickly. 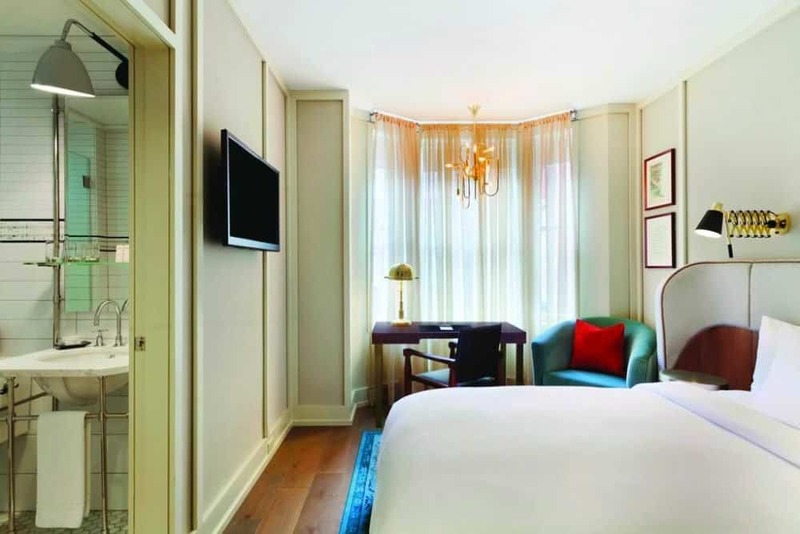 Formally known as The Gershwin, the former shabby chic art hotel has had a complete revamp. 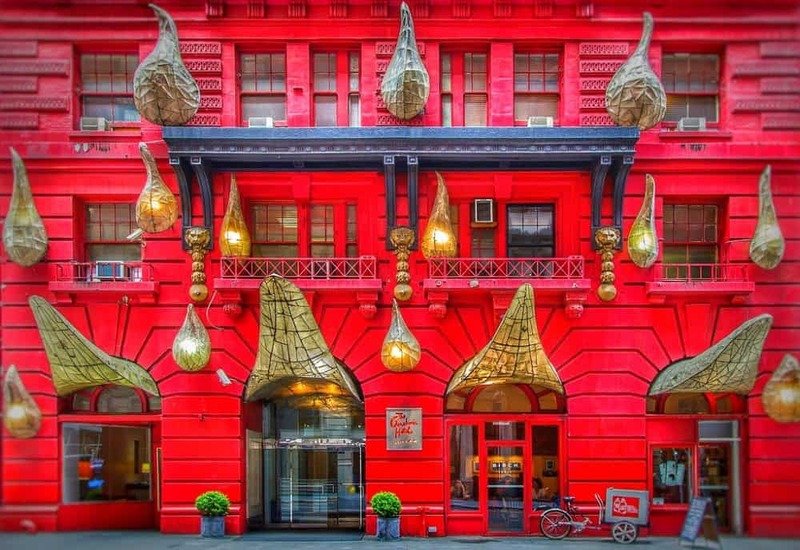 The three-star hotel still has a budget focus, the same funky bright red facade and a fabulous location in the heart of the ultra-trendy Flatiron District but with newly renovated rooms and a slightly more hipster style. 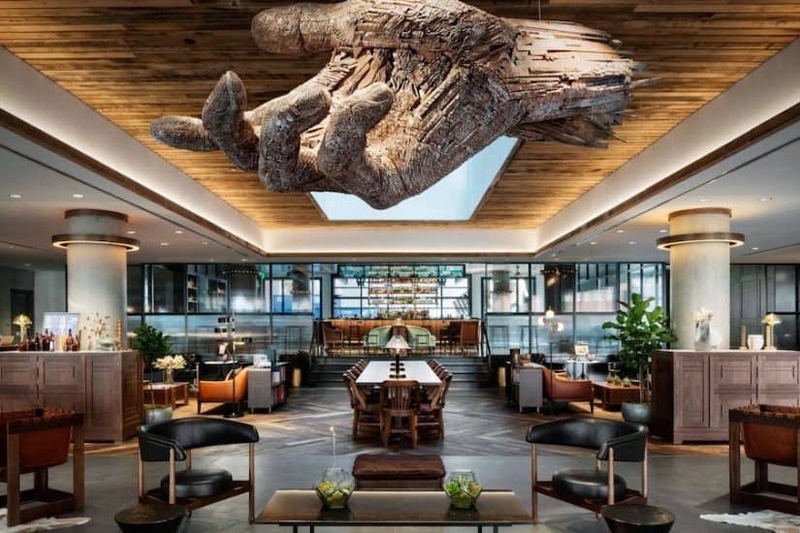 Now you can expect more upscale interiors at the highly rated The Evelyn with a cool edge, original artwork and more mod cons. Standard rooms come with rainfall showers, the suites have whirlpool tubs but handily there is still the shared dormitory option for those on a tighter budget. A pretty fabulous all-rounder! Once home to salty sailors and Titanic survivors, the highly rated The Jane Hotel is a living work of art. A true (budget) boutique hotel, its rooms are designed as ship’s cabins and are small but perfectly formed. All the rooms are equipped with wireless internet, a flat-screen TV and a safe, and are decorated in warm colours and period furnishings. 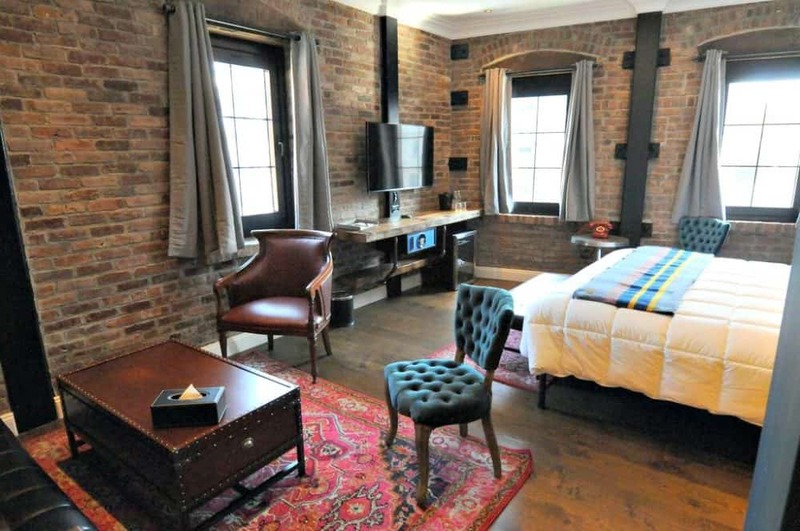 The Jane is located in the ultra trendy Meat Packing District – just a short walk from Soho and Chelsea. Take advantage of the free bicycle hire on site, dine in the pretty Cafe Gitane, and be sure to tip the immaculately dressed bellhop! 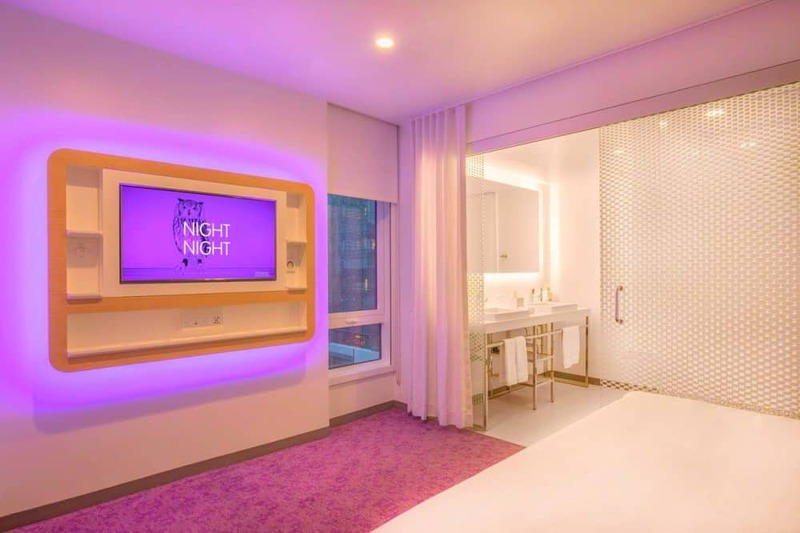 The Pod prides itself on being a hip, affordable New York City hotel, and its central location and chic decor makes it a great choice for budget NYC visitors. 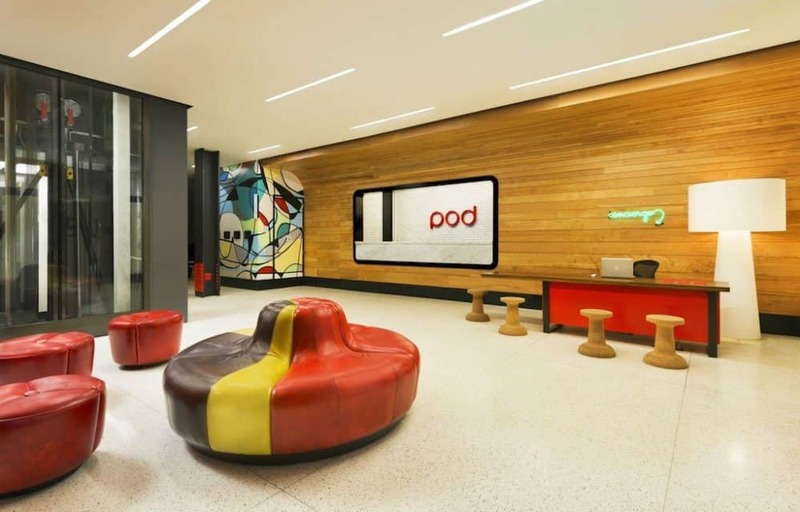 Only a mile away from the iconic Rockefeller Center, and within strolling distance of Midtown East’s quirky shopping district, the highly rated Pod 51 Hotel is a modern, funky and colourful residence which is easily one of the best budget hotels New York can offer. Choose from single, double or bunk bed Pods (rooms) and enjoy flatscreen TV, free WiFi and dimmable mood lighting. For those on a tight budget, there are dorm rooms with shared bathrooms. Don’t forget to check out the on-site restaurant for tasty organic food. Prices from $89 per night. Well loved and often talked about, the highly rated Broadway Hotel and Hostel caters for travellers on a limited budget. It features both private and dorm-style rooms, and is located on Manhattan’s Upper West Side, just 4 blocks from Central Park. 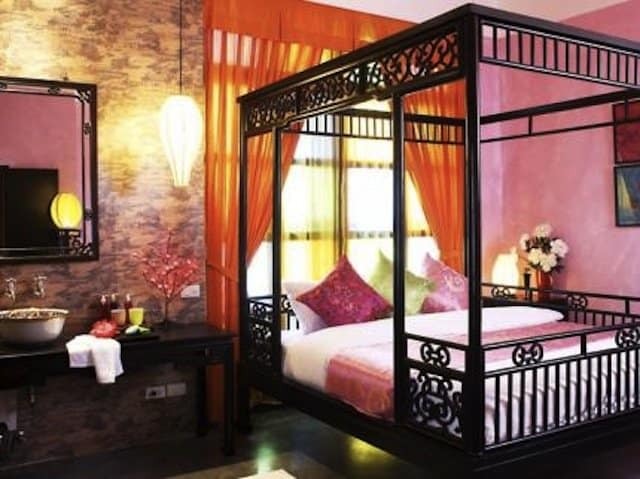 Decorated in a boutique Asian style, all the rooms feature flat-screen TVs, air conditioning and an iPod dock. The dorm rooms are also well equipped and have shared bathroom facilities. Close to the underground and within easy reach of all Manhattan has to offer, The Broadway is a great budget place to stay in New York. Prices from $45 per night. 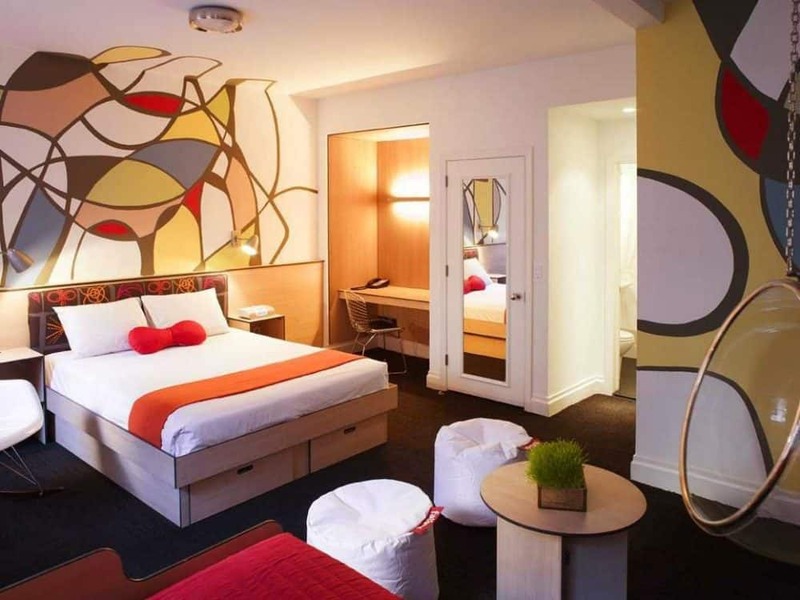 Lower East Side’s highly rated Sohotel is located a stones-throw from Little Italy – a vibrant Manhattan neighbourhood which offers plenty of dining options. 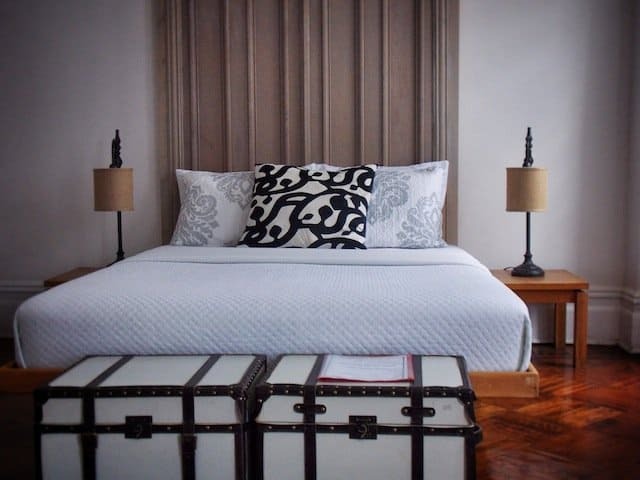 This is an outstanding budget boutique New York hotel which offers a good choice of room types (all decorated to a high standard) with the usual modern facilities you’d expect from a boutique hotel, but the without the designer price tag. The dark woods, exposed brickwork and animal print furnishings make for a glamorous stay, especially in the Regency Plus room which features a marble bath suite. Prices from $115 per night. Housed in an impressive 1931 Art Deco building, history buffs will love the fact that the hotel is named after Thomas Edison (who turned on the lights when it first opened). Hotel Edison has both a striking exterior – all bold lines and curved edges and a classic elegant interior. It also happens to enjoy an excellent central location based only a few steps away from the razzmatazz of Broadway and Times Square. Expect well turned out en-suite bedrooms, internet access and even a classy piano bar all for a price which won’t break the bank. We’ve all heard of the fun food chain YO! Sushi now you can stay at the hotel equivalent! 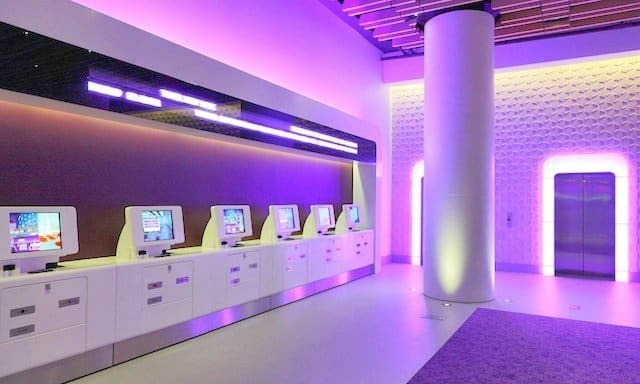 The highly rated YOTEL is a super futuristic, funky place to lay your head but without the humongous price tag. Aiming to fit into the affordable but different niche, this fun place is located in an equally as fun location – Times Square. Expect innovative technology including motorised beds (which transform into sofas), a funky’ techno wall’ with flat screen TV, a work desk with iPod connectivity and handily free WiFi and local phone calls. Other unique features include an automated check-in and a self-service galley on each floor. 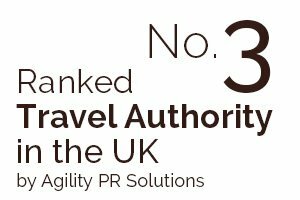 New York is known for its forward-thinking creativity and the highly rated Carlton Arms is a perfect showcase for this. 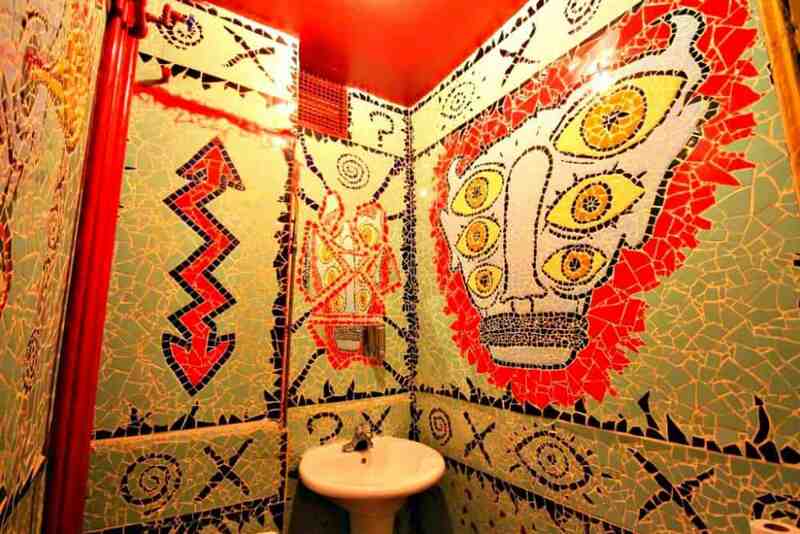 An excellent choice for arty types on a budget, this unique New York budget hotel has even attracted a few celebrities in its time – even Banksy has painted here. 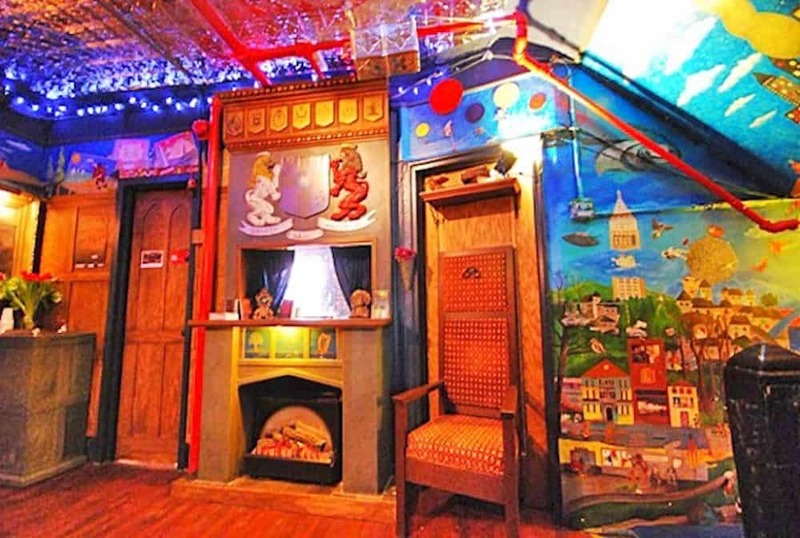 Remaining very unpretentious, the decor is more edgy than designer and each of the funky 54 rooms has been painted by an up-and-coming artist. The result is a fun, liberal explosion of colour which is the antithesis of a sterile chain hotel. Manhattan island may get all the attention, but for cheaper New York hotels also look on the surrounding boroughs – you’re more likely to get better value for money. The highly rated Serenity at Home Guest House is located in Brooklyn, just over the bridge from Manhattan island, on a pretty tree-lined street, close to the Botanical Gardens. A B&B with an old school feel, the Serenity dates back to 1901 and offers cosy, warm spacious guest rooms. Check out The Serenity Suite, a separate one bedroom apartment that has access to the lovely gardens of the house. Located in Manhattan’s Lower East Side, this great value budget NYC hotel is set in the heart of Chinatown – a bustling colourful neighbourhood with plenty to see. A stone’s throw from the Brooklyn Bridge, and within easy reach of transport links, teh highly rated Hotel 91 is a very good value-for-money residence with well-appointed rooms and facilities. Proud of its Chinese roots, Hotel 91 is a clean and functional hotel at a great price. Nearby Little Italy is worth exploring, as is Clinton Street – a trendy avenue of cafes and eateries including the famous Clinton Street Baking Company & Restaurant. This is another fantastic budget hotel located just across the bridge in Brooklyn. The highly rated Condor Hotel is a chic and stylish residence perfect for those who love their classy stays, but without the hefty price tag. Condor’s target market is actually Orthodox Jews but they welcome all people of religious beliefs! The Condor hotel has a trendy modern design, a good range of facilities and a plentiful hot (kosher) breakfast served every morning. Guests can even relax in the hotel’s own well-tended garden – perfect for that post-shopping long drink. 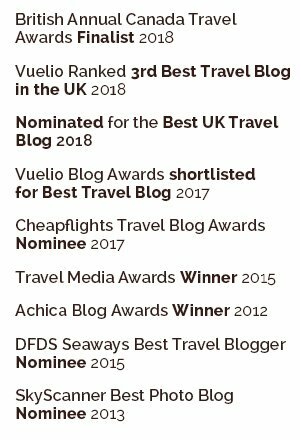 We also have a post on the best budget hotels in London. Broadway hotel is a really great deal for those traveling to New York and on a budget. It’s really worth the money and you get to stay in Manhattan! You can let the Carlton Arms know you have just sold a booking! Look at that – truly one of the most gorgeous rooms I have seen. Great selection guys! Will definitely look back on this when I next visit! 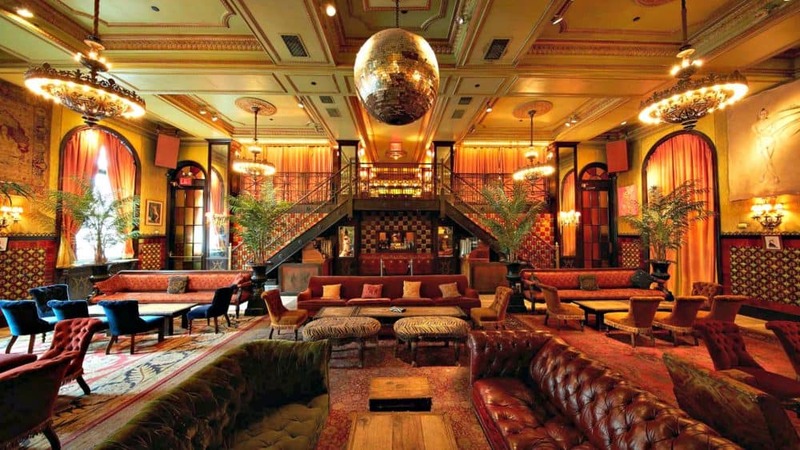 Awesome list of hotels in NYC. I am really hoping to visit NYC soon and this will be really helpful for me to find a good place to stay in NYC! Awesome list!! I’m really hoping to get back to NYC this year, so I will have to check these out! Let us know how you get on Katie! HAHA I LOVE, the “welcome sailors and Titanic Survivors” brilliant. Thanks for sharing these budget safe hotels…is using Airbnb safe for all areas of NY? We haven’t tried Airbnb in New York but the trick is to check all the reviews carefully! Thanks for sharing this list of budget hotels in New York, it will be very useful for my next visit to the city! I usually go for the more comfy, old-fashioned places, but I’d definitely give The Pod a try. It looks so cool without having that… cold feeling I sometimes get with the very modern places. It’s hard to find a good budget hotel in New York but there’s some great choices here! I like your website. I Love the pics of the hotels. I stayed at the POD and I had a good experience there, they have a wonderful rooftop. I’m thinking about going to NY next year and this is very helpful. 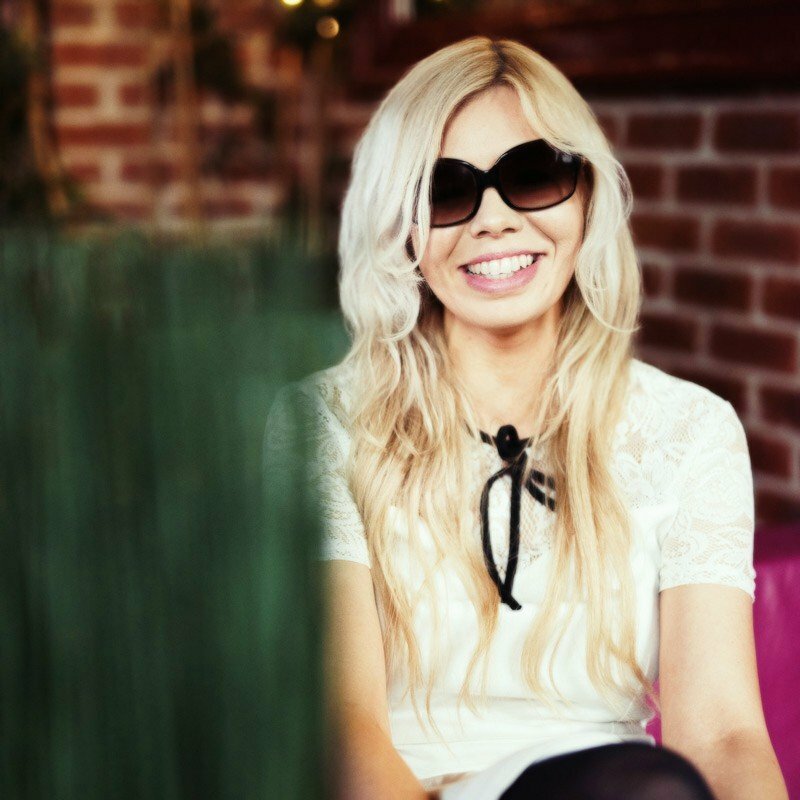 Thankz for sharing this great article. I’m thinking about going to NY for the first time this winter so this is very helpful. Thanks for the great finds. very interesting site 🙂 I’m thrilled and look quite inspiring, I am intrigued by your suggestions coming. 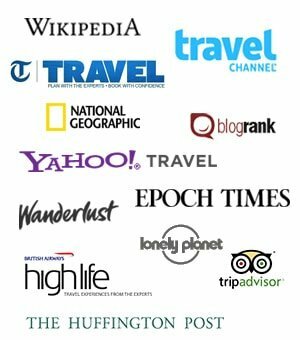 The Sohotel is my go-to hotel in NYC, I am so glad it is on this list! It is also really great if you have a larger group. They have rooms with 3 beds, and it is much cheaper than having to get a second room. NYC is so expensive. This list will help me a lot! Looks a top place to rest your head! Park 79 sounds like a really good place to stay. super useful list! we’ll have to try these the nxt time we’re in NYC. for now, we’re paying a conference rate, which is still WAAAAY more than these. These are some great places.What do you think? I had no idea there even was such a thing as budget hotels in NYC! 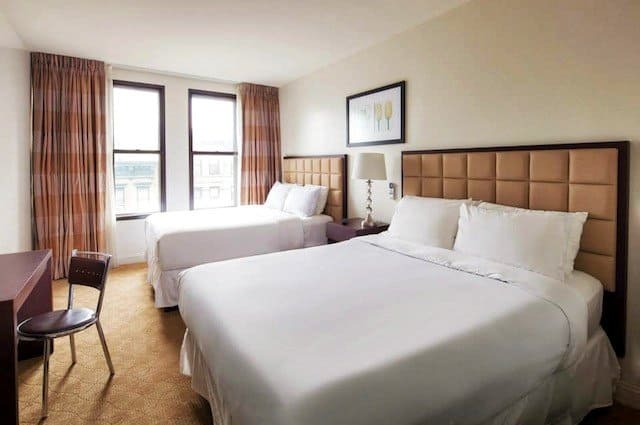 There are excelent hotels just after the Lincoln Tunnel, on the town of SECAUCUS. In the neiborhood one can find Walmart (none in Manhattan) and other stores. Of course, hotels offer free parking for those that need a car for rides outside Manhattan. Great list! I love to travel but have not yet been to New York, however I hope to be able to go there soon. Thank you for sharing! This is a great little list. Some of these hotels have amazing lobbies like the Condor hotel, for example. I also really like the DISTRIKT HOTEL, they give you an organic brownie in your room and a personal welcome letter. We were in New York back in July ’09 and I was pleasantly surprised how reasonable the accommodation was. We stayed at a small hotel just a block away from Rockafeller Center in Manhattan and paid less than $80 a night. There are definitely some good deals to be found if you do your research. what a view you get at that Holiday Inn! 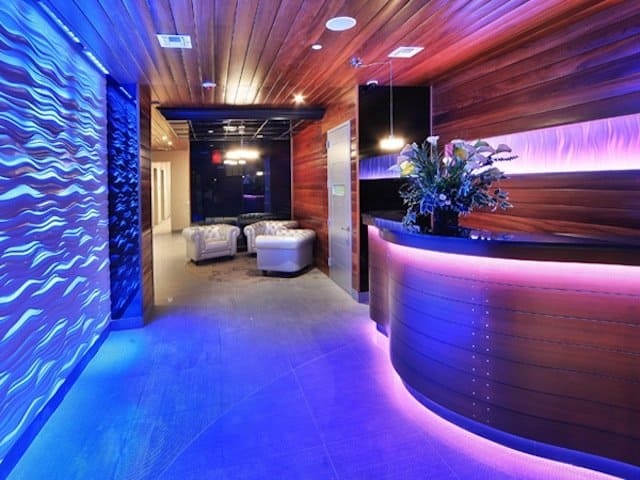 Love the pics of the hotels, especially SoHotel! We need more exposed brick here in Spain…miss that from the city! I’ve stayed in the Gershwin a lot. Will have to try some of the others. I love NYC!!! Love the Gershwin! Such a great choice! 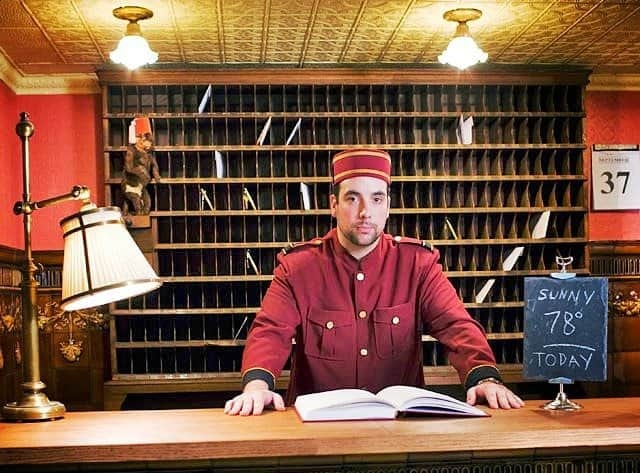 There is a way to get $50 coupons to use on hotels. It’s the best budget way to travel. I stayed the Gershwin once and loved it. Got a single room that was enormous for Hostel prices in the city. It was a good few days. I love Cafe 28 on the corner too. 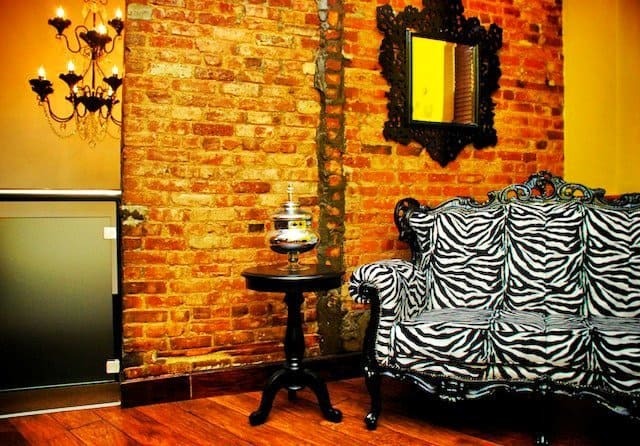 L-Hostel in Harlem is pretty awesome for the more adventurous traveler. Just a couple blocks north of central park and not far from several subway stops, its a pretty good location. Stayed there with a group of 10 or so and had a great time. I think we paid $80.00 for the weekend (Friday and Saturday nights) I would do it again in a minute. The Bowery House is a great option on the Lower East Side. Rooms start at round $60 a night. I can recommend the Ramada Inn on Crescent Street in Long Island City. Very clean, well appointed with king size beds, flat screen TVs, coffee maker and fridge in room … they even provide breakfast in the lobby! And a great buy, particularly if you have AAA! Please tell me how to get a room at the Holiday Inn Long Island for $70. I tried to book and the standard room was $207. What’s the secret? Since publishing the article the prices have gone up so we will amend it now. Although you can still get a good deal (around the $110 per night mark) if you book a few months in advance. Also check out peer-to-peer hotels, like those offered through AirBnB. The problem we found on our to NY in August with these budget hotels is that the rate they advertise is per person. Which isn’t great for a traveling couple like us. Broadway Hotel & Hostel, for example, advertises $60 per night rooms, but it’s actually $120 for two people – and that’s for a shared bath, and doesn’t include taxes (another $20 bucks per night). On AirBnB we booked a single room, with a private bath, and complementary breakfast, on 60th Street & York for $86 per night, all-in.